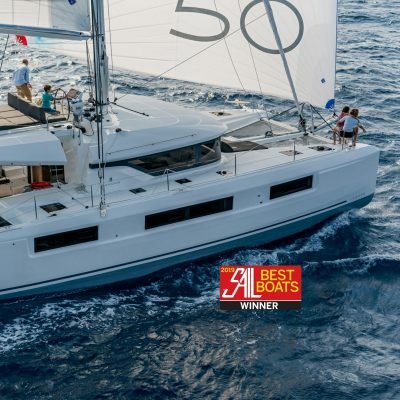 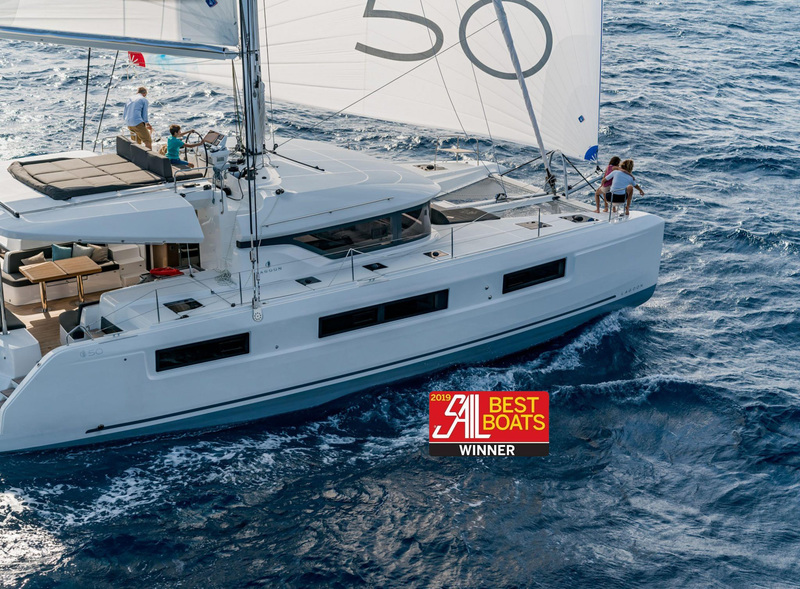 Sail Magazine’s Best Multihull of the year 2019. 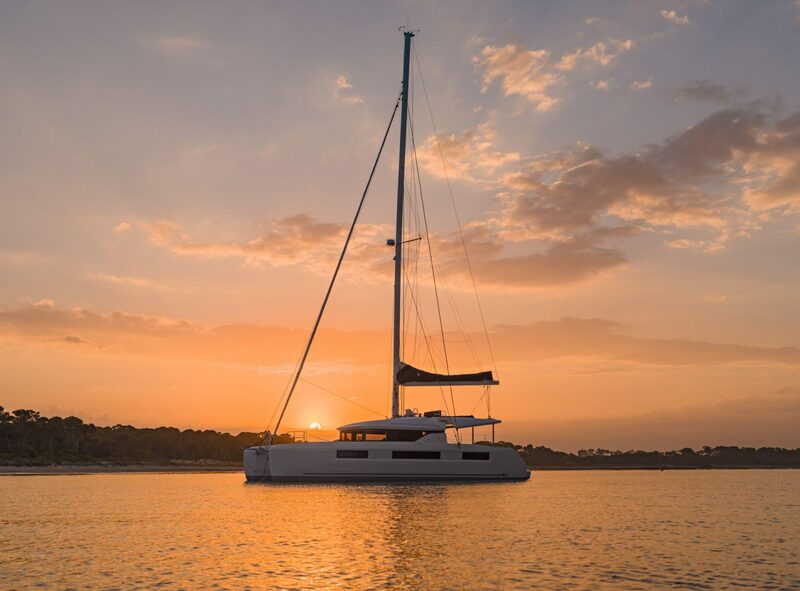 In developing the Lagoon 50, expert French designers VPLP Design have created a gorgeous catamaran. 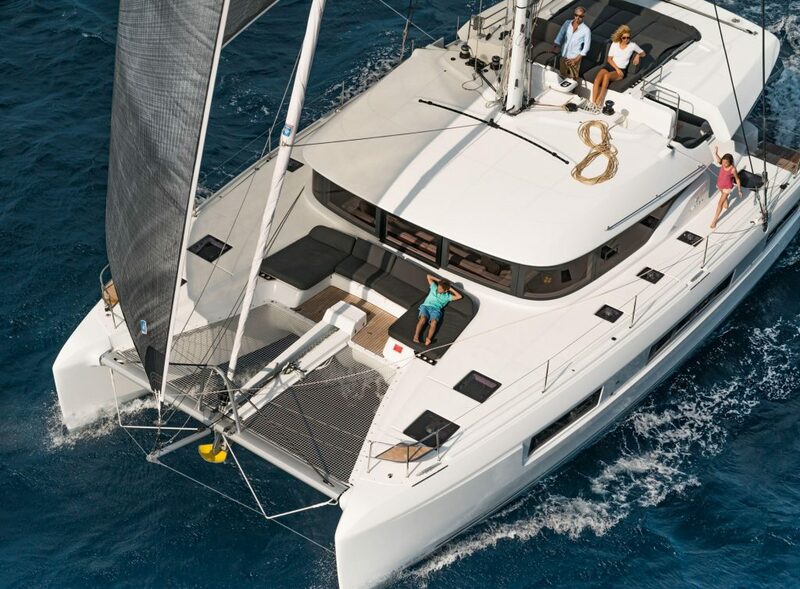 She has sporty lines combined with luxury, versatility and an array of technical options to suit everyone’s needs. 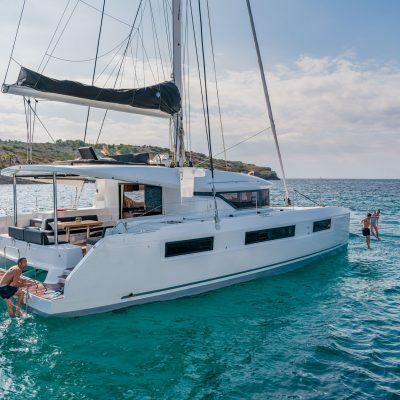 A large catamaran with innovative ideas giving you amazing comfort and total freedom. 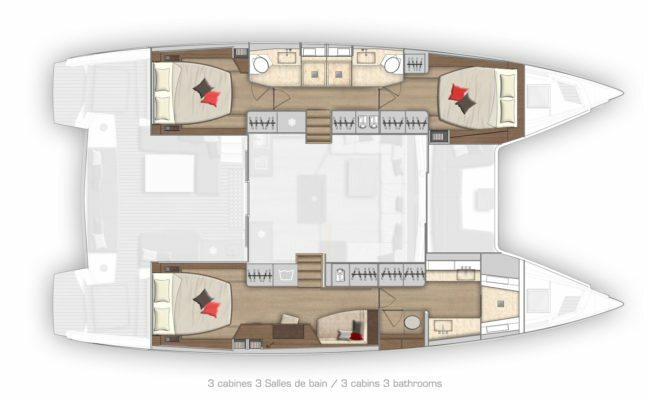 Fresh, elegant and functional below with impressive space and a choice of multiple cabin layouts. 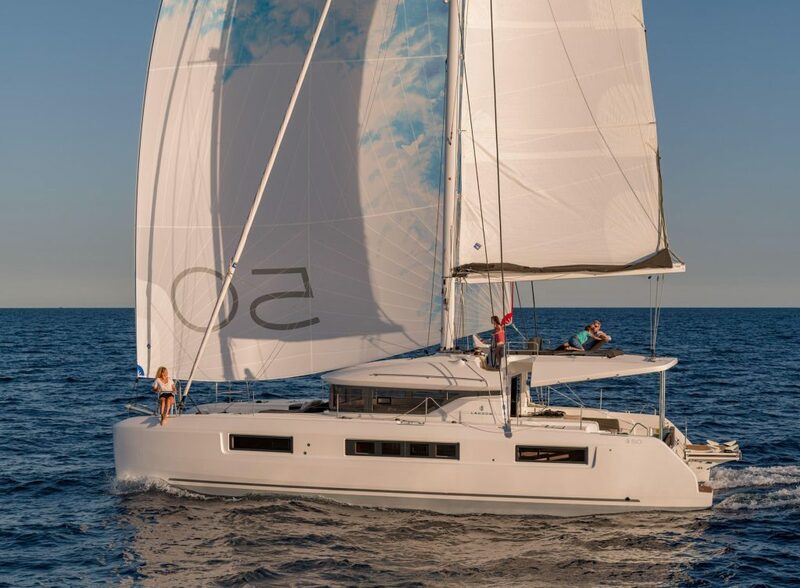 A centered helm, electric sail controls with high aspect mainsail and self tacking jib gives a balanced and smooth sailing experience. 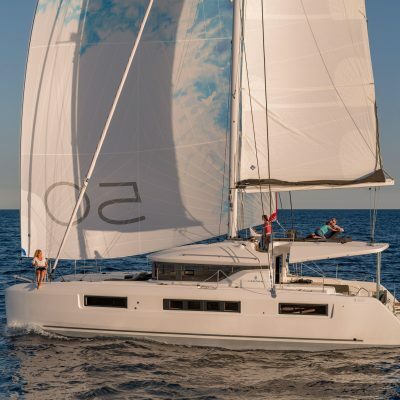 If you would like to find out more or buy a Lagoon 50 contact us here, or email Robin Hodges, our yacht sales manager. 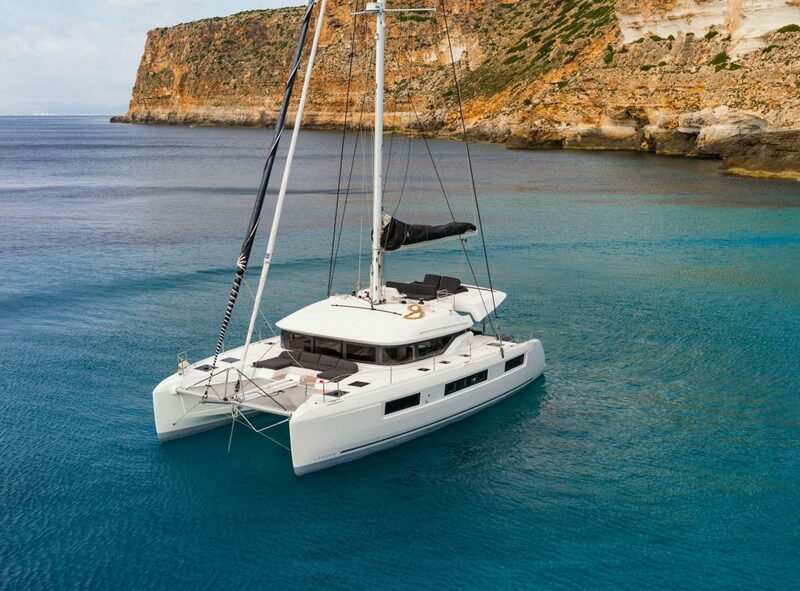 robin@horizonyachtcharters.com Please scroll down to read more about this fabulous catamaran. 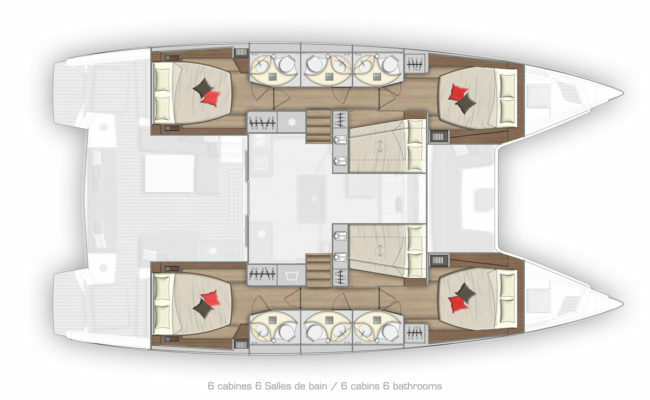 This is a sociable boat with multiple areas to relax and enjoy. 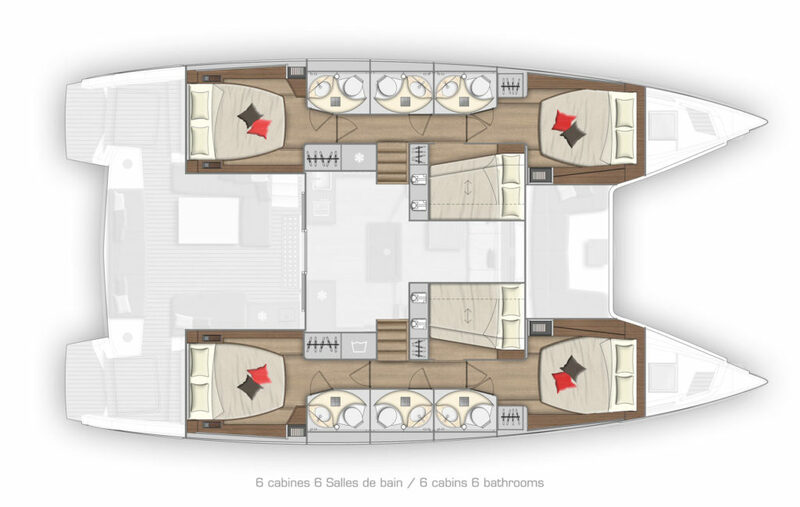 Huge sun-loungers on the fly-bridge behind the helm-station for soaking up the sun, a neatly designed forward cockpit with dual function (seating or deck-chair) cushions flush with the trampoline, a large aft cockpit with benches and sofa’s as well as a dining table that opens out to seat 10 or more. 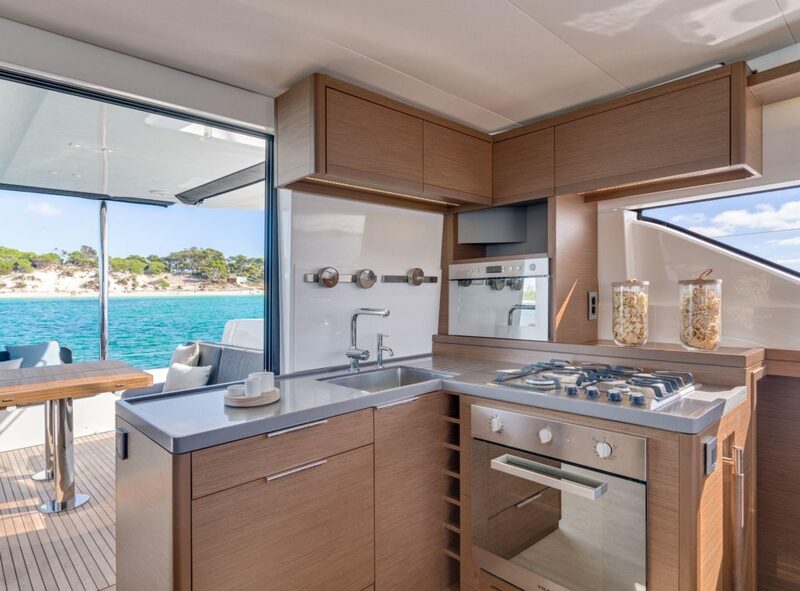 There is a sink, fridge and ice maker here too and a very neat built-in swivel BBQ. 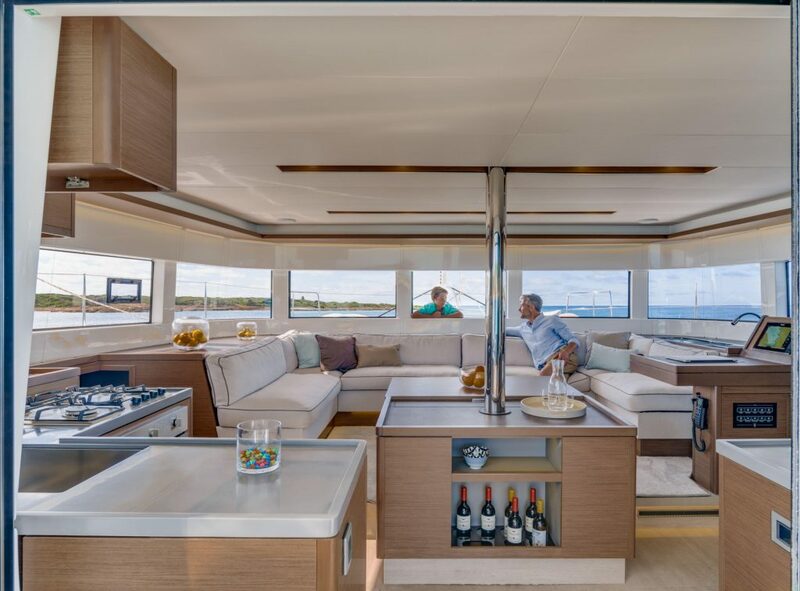 The saloon itself is has a slightly elevated lounge area which gives better views outside, and an innovative dining table that folds down to a cocktail table, clever indeed. 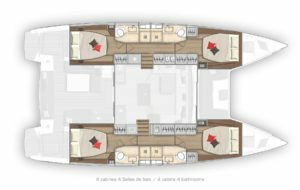 There is impressive space around the seats. 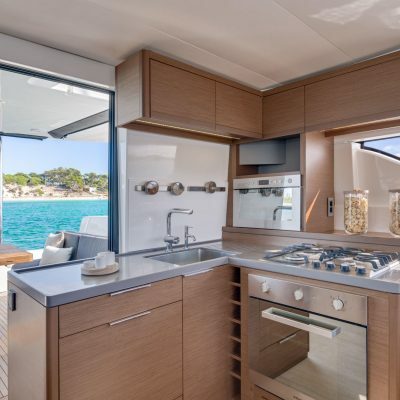 A large central island provides extra counter space to a practical galley, a liquor cabinet as well as offering housing to a fully retractable television. 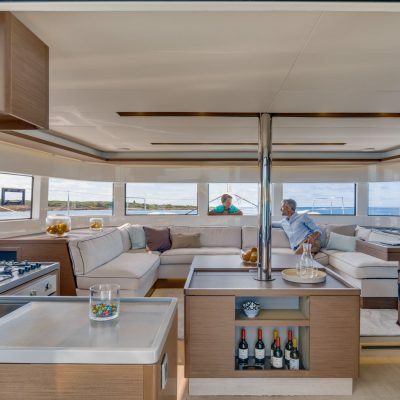 Masses of natural light streams through the wrap around vertical windows, and there’s a retractable window for maximum ventilation as well as passing drinks to the forward cockpit. 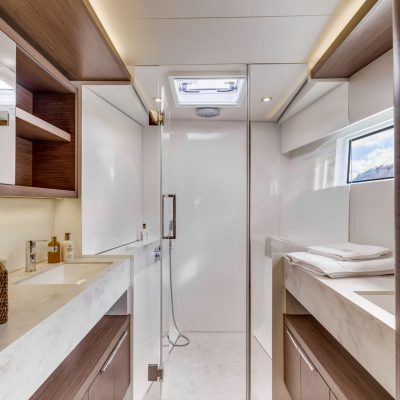 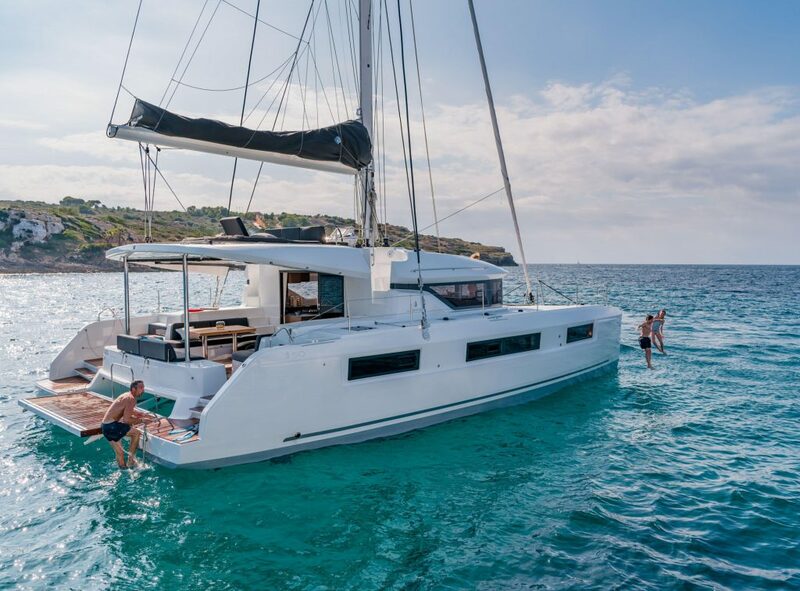 Fully air-conditioned, with generator, extensive fridge and freezer space and water-maker option, this is a truly luxurious catamaran. 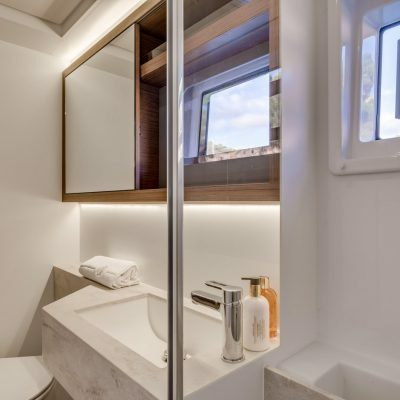 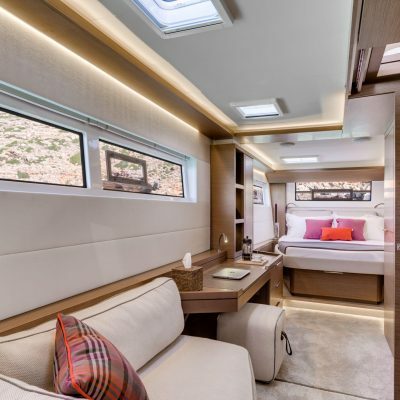 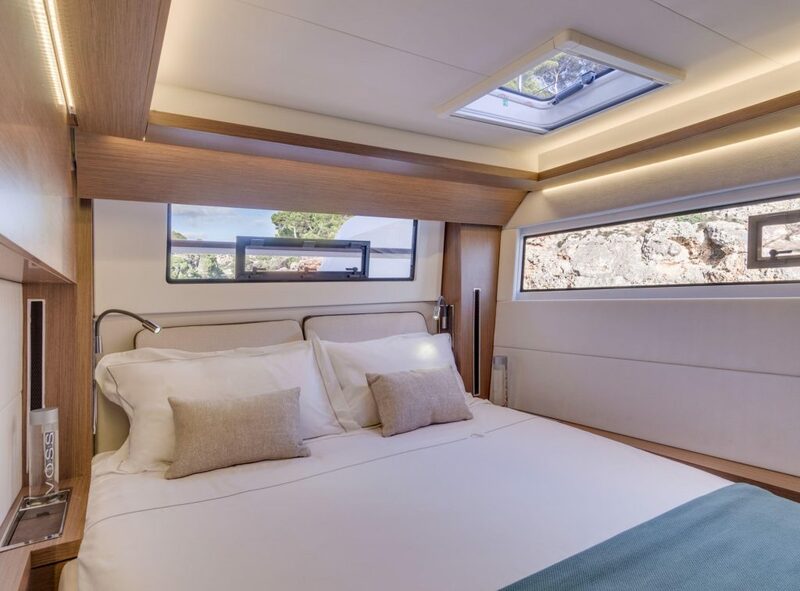 Design of the interior and accommodation is by Nauta Design, and it’s exceptional; fresh, elegant, functional, and most of all remarkably comfortable. 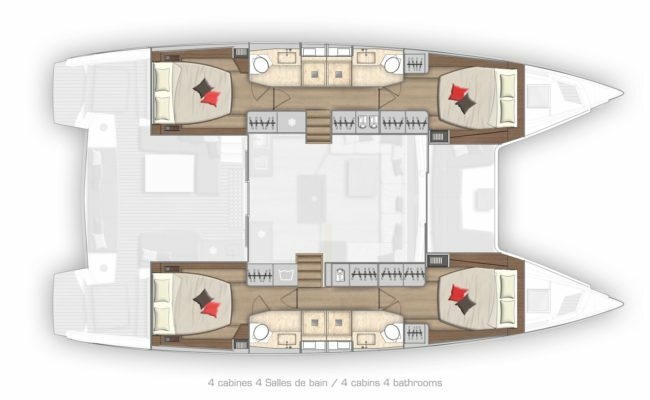 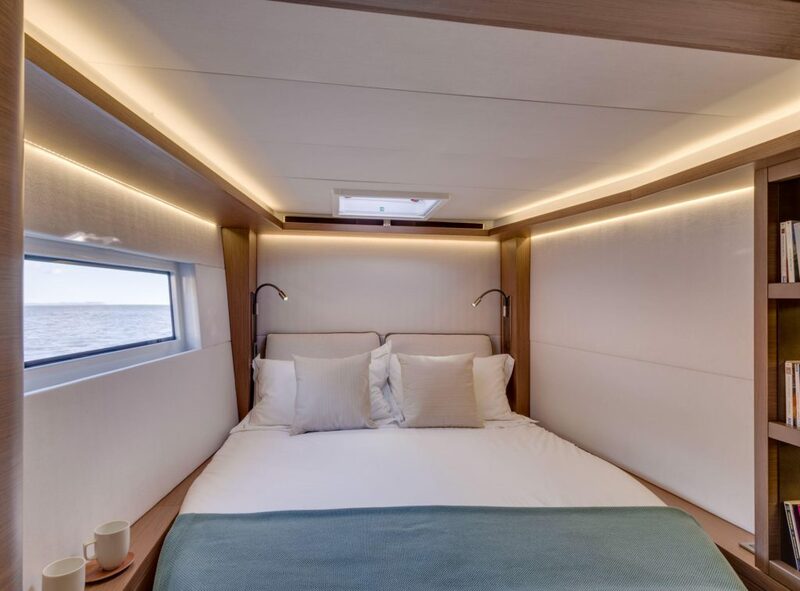 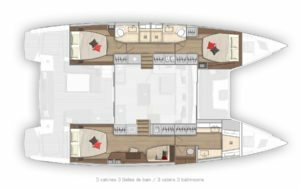 In the hulls you can have multiple cabin layouts, and depending on how you want to use the boat you can have up to six cabins! 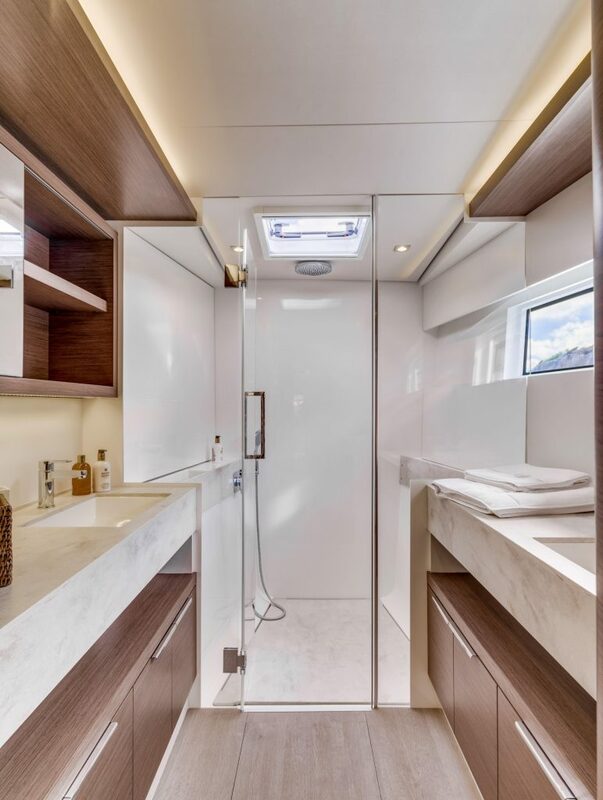 Along with this there are a variety of shower/head options. 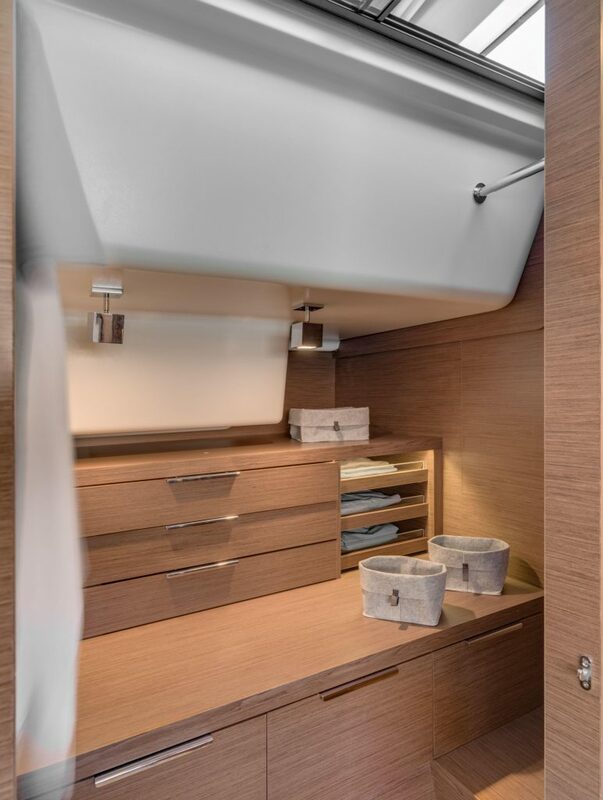 Island berths forward and aft, and masses of storage in hanging lockers and cupboards, give comfort and great space utilization. 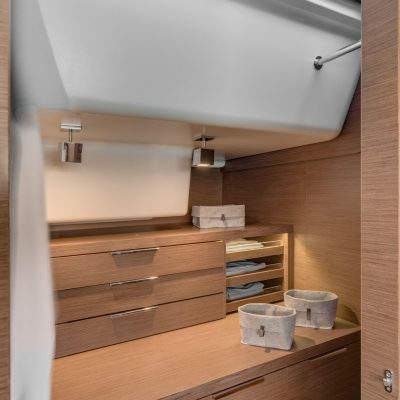 You also have a choice of interior joinery finishes and multiple soft furnishing options allowing personalized customization. 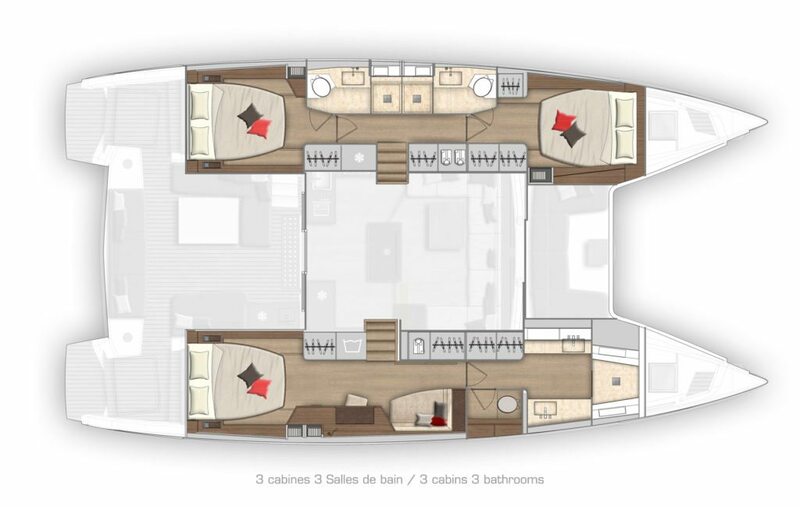 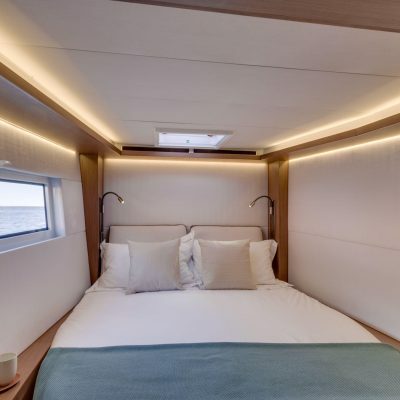 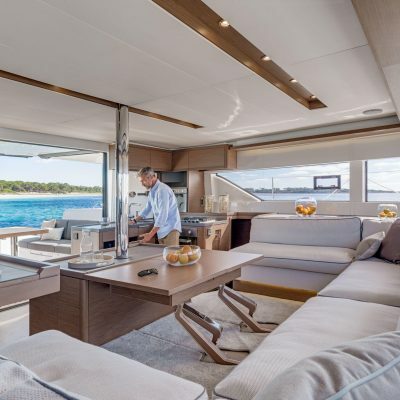 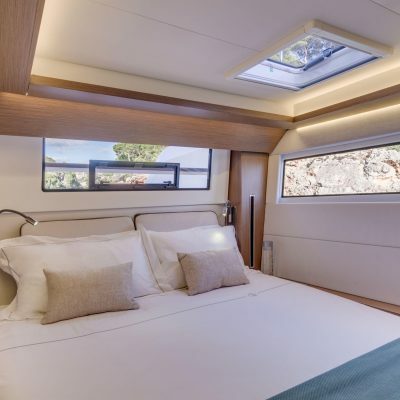 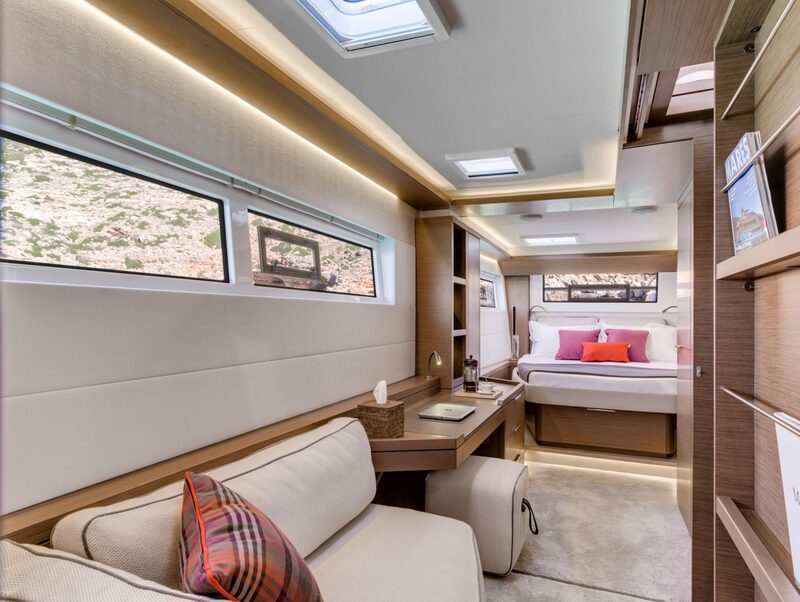 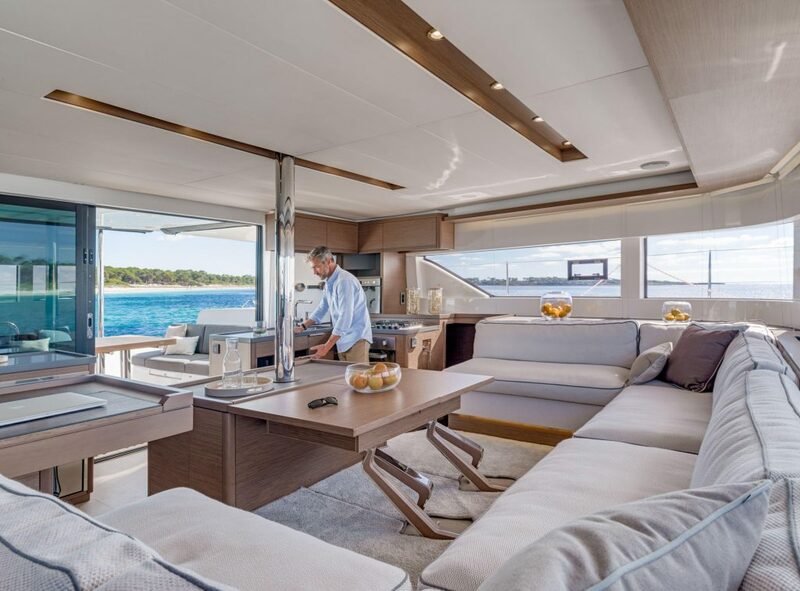 Large panoramic fixed hull windows with opening port-lights means natural light in abundance and plenty of ventilation. 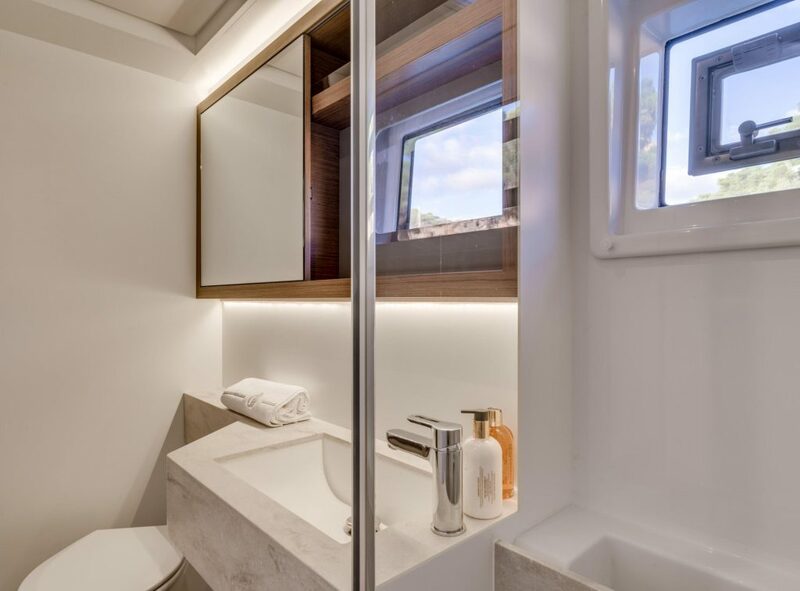 The cabins all have a light and airy feel that adds to the feeling of space and comfort. 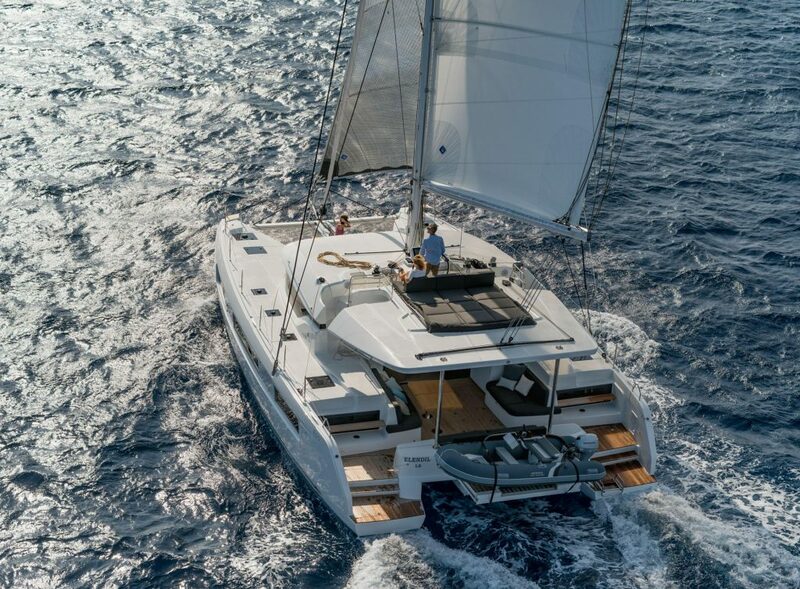 The mast step positioned further aft, which stems directly from VPLP’s experience in competitive sailing, creates a balanced and smooth sailing experience. 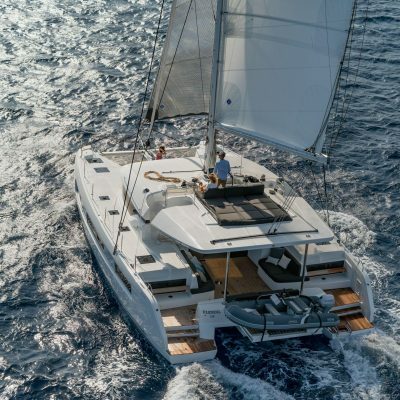 The shorter boom and high aspect mainsail, trimmed using an electric captive winch, makes for easier sail handling and maneuvering as well as optimized performance. 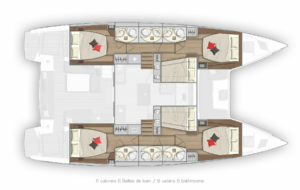 The wheel is in the center of the boat and visibility around the boat is good. 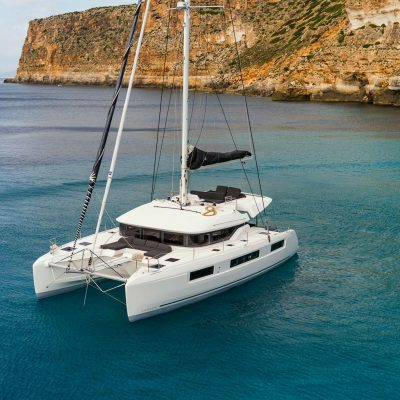 All in all, with electric winches, autopilot and the latest B&G navigation equipment sailing this boat can be very simple to handle and sailed comfortably with few crew. 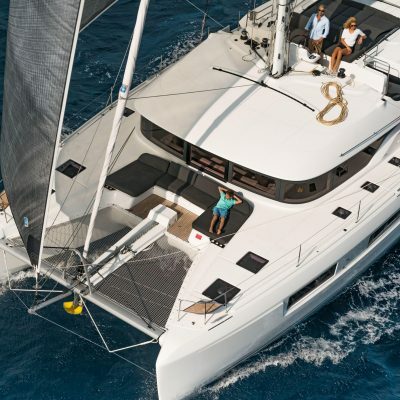 Under power she is smooth and responsive, and there is also a bow thruster option for even easier docking. 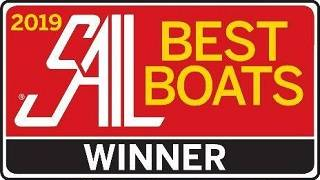 The Yanmar 57 HP diesels are powerful enough but there is an upgrade available to 80HP that we would recommend. 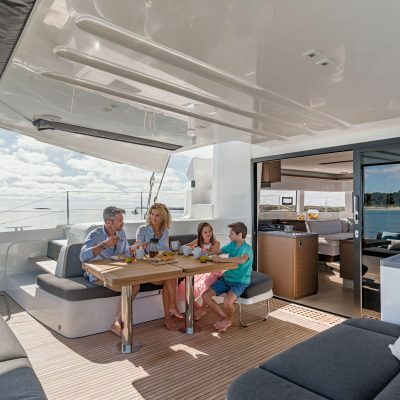 Coming aboard the Lagoon 50 couldn’t be easier, the transom steps are wide and the steps up to the cockpit are shallow. 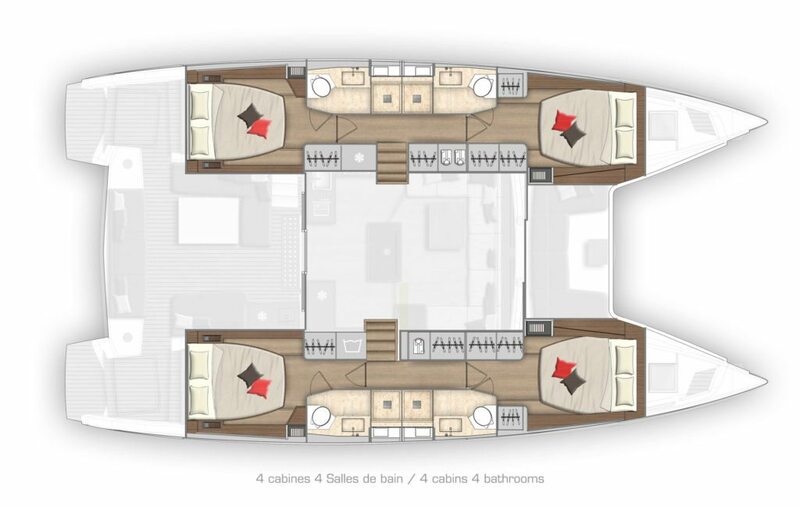 The side decking is wide with flush hatches and plenty of handholds when moving forward or aft. 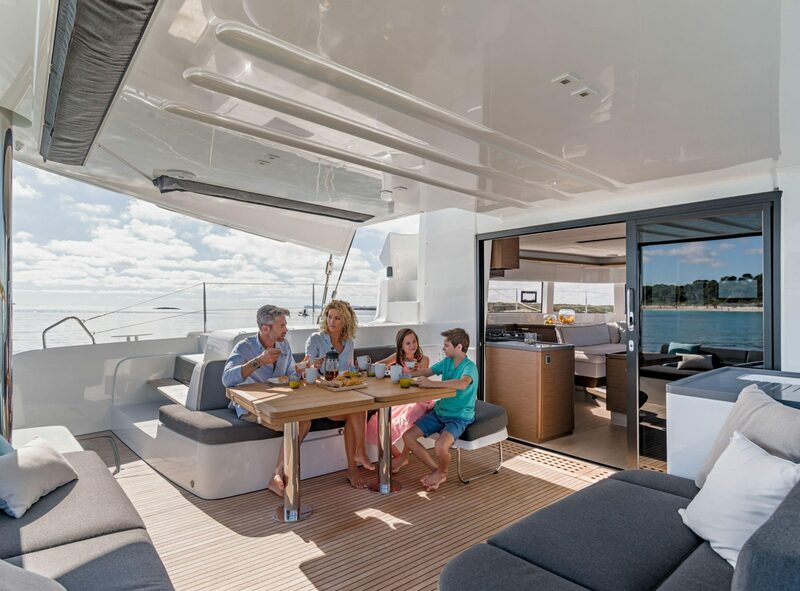 Access up to the fly-bridge is from either side of the boat with wide safe steps. 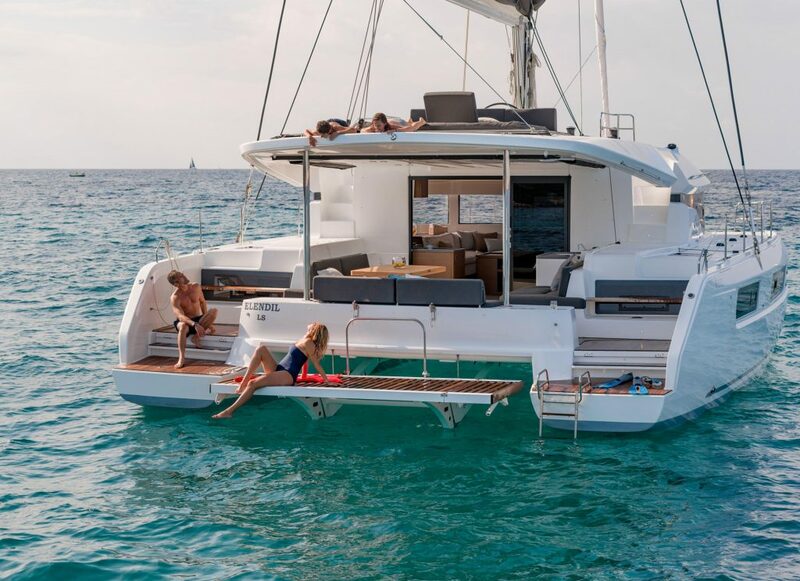 There is also a terrific remote controlled tender-lift, designed to handle a 12 ft dinghy and outboard. 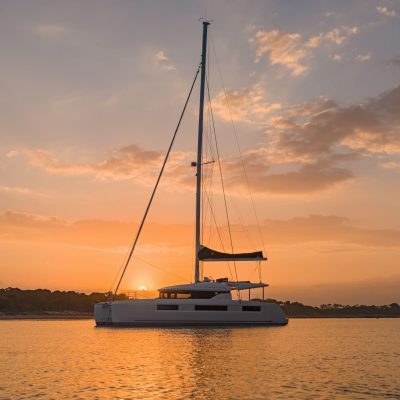 This makes storing the dinghy a pleasure rather than a chore, With the dinghy launched, the tender-lift transforms into a great sunbathing area, or lower it to the water and use it as a swim up bar!